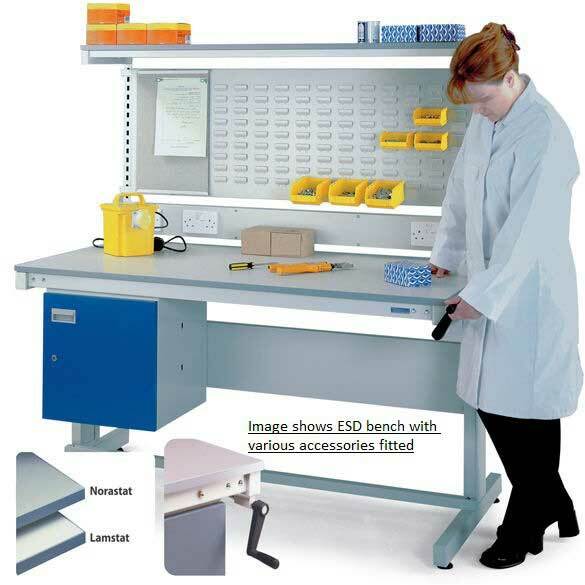 Made in the UK, this Height Adjustable ESD Workbench with Lamstat Top will provide years of trouble-free service for applications ranging from light industrial to high tech commercial. These workbenches help to reduce the chance of electrostatic discharge (ESD) because the workstation surface is made from grey synthetic rubber that dissipates static. It has a leakage resistance of 106 – 108 ohms, perfect for a wide range of applications. A simple hand crank allows the work surface to be adjusted to a height of between 730mm and 950mm. Employees of nearly any size or shape can sit and/or stand comfortably at this Lamstat workstation. The adjustability means that the workstation helps employers to meet health and safety requirements and it can also help employees to enhance their productivity and job satisfaction. The workbenches can be accessorised with a wide range of options, including cupboards and cabinets, a zinc-plated combination back panel, a data point, and a surface electrical service duct. A fluorescent light fitting can be added for additional task lighting. The work surface has a durable powder coated finish. 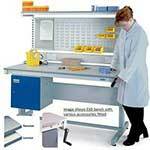 The Height Adjustable ESD Workbench come fully assembled for the ultimate in convenience. Purchasing these workbenches not only helps to meet health and safety requirements, but also can enhance employee productivity and satisfaction.